You’ll find the lounge as you enter the C Concourse of Terminal 1 via the neon-lit underground passage. As you come up the escalator, the lounge entrance is just to your left adjacent to the customer service area. This lounge is the home of the former International First Class lounge, though has been expanded to better handle larger crowds. The lounge is open daily from 7:15 A.M. to 9:00 P.M. Lounge access is reserved for longhaul business class passengers on United or a Star Alliance partner. Access is not permitted to Global Services or Star Alliance Gold members traveling in economy class. If you’re traveling on a same-day United longhaul flight in Polaris, even if not from Chicago, you also have access. 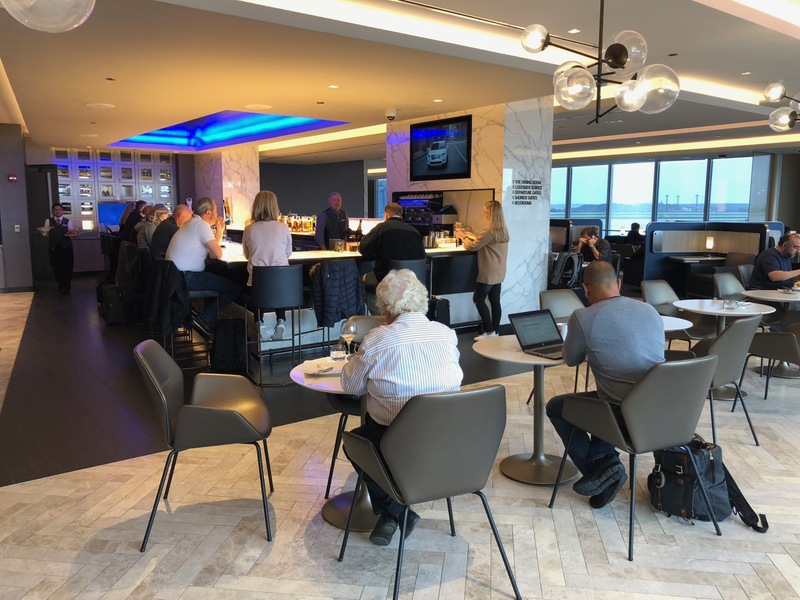 For example, if you flew London to Chicago in United Polaris Business Class, and are connecting to, say, Des Moines, you have access to the lounge upon arrival. One more example. If you are flying, say, from Chicago to Newark to Frankfurt, you would have access in in both Chicago and Newark as long as your longhaul flight is in Polaris business class. If your flight from Newark to Frankfurt is on Lufthansa, you only have access to the lounge in Newark. Only guests traveling in first class bring in a guest. This is the most crowded Polaris Lounge I have visited. San Francisco and Newark did not appear nearly as crowded during my visits. I had no trouble finding a seat and would not call the lounge over-crowded, but it was pleasantly full until closing time. I love that the suites have tables that pull out, which made working on my laptop quite easy. There’s also an easy-to-reach power plug and USB charging port. If you have trouble finding a seat, head to the back corner of the lounge near the a la carte dining area. I found that seating area consistently empty during my visit, though the area lacks the comfortable suites available in other parts of the lounge. Eight shower suites are available and all were unoccupied when I checked them out. The suite includes a walk-in shower with rainhead, sink, and toilet. Clothes pressing is also available. The floors are heated! I noticed that the paint is already pealing on the shower ceiling. United needs to ensure that this lounge is properly maintained. Gender-Neutral individual restrooms are located near the flight help desks. Unlike the showers, the restrooms were quite busy. Before you start turning handles, look for a small red “occupied” or green “vacant” sign above each door handle to indicate whether the restroom is in use or not. Four daybeds are available. Blankets are available upon request and even heated. Pillows are already in the suite as well as a hydrating spray from Cowshed, ear plugs, eye shades, bottled water, and a phone charger that also can emit soothing sounds like rainfall or running water. I thought the buffet in this lounge was more impressive than Newark or San Francisco. It included a nice salad bar, several hot options with cuisine from around the world, various assortments of bread, two soups, cheese, appetizers, and desserts. However, I headed over to the dining room for an a la carte meal instead. The a la carte dining room is small in this lounge, but the dining room was not crowded during lunch…and dinner. I only intended to have one meal in the lounge, but when my flight encountered an extended delay, I ended up having two. Let’s start with lunch, where I went all out. My meal began with a meatball appetizer and , a cocktail called Lavender Lift flavored with Proseco, vodka, and lemon and garnished with lavender. I though the booth was very comfortable and liked the table settings. Next, I had a bowl of tomato soup. The portion was huge, but the soup was very tasty. I wanted a light salad before my main course and requested one, but was told it wan’t on the menu. Yes, but how hard is it to assemble some greens on plate and add some salad dressing? I ended up getting it myself. My server was not very attentive and I did appreciate the lack of effort in accommodating a small variance from the printed menu. I did end up enjoying my self-assembled salad, though. For my main course, I ordered seared ribeye. This dish normally comes with a sweet sauce and rice, but I asked for it plain. That was a smart choice because quality meat cooked the right way needs nice sauce. This was excellent beef. Finally, I ordered bread pudding for dessert which was probably the highlight of the meal. Oh how tasty the warm vanilla sauce was on this. It was spectacular! I also ordered a cappuccino with dessert and a machine-made one was brought. With my flight delayed over three hours, I returned to the lounge for dinner and enjoyed a cheeseburger with French Fries. Wow, this burger was far better than the cheeseburger I had in the Polaris Lounge in SFO. The service was poor, though. I took a seat and was totally ignored for over 10 minutes by the waiter (as was the guy sitting next to me). Finally, I signaled for the guy to come over and he seemed completely clueless that I had not been served yet. The bar was the most consistently crowded part of the lounge. I was going to order a cocktail, but then decided to skip it and just drink water. I’ll still have a cocktail and coffee when in lounge from time to time, but water is always best before flight. I’m sorry to report that the coffee in this lounge is not nearly as good as the other Polaris Lounges I have visited. I noticed that the bartender used an illy pod rather than freshly grinding the coffee when making meh cappuccino. The difference in taste was quite noticeable. This lounge encounters denser crowds than other Polaris Lounges, but I very much enjoyed my stay. Not only was I productive, I enjoyed two great meals. What an improvement from the Untied Club or even the old International First Class lounge! Such a shame that United doesn’t offer anything above a United Club to a GS member traveling int’l economy. Would be nice if they had lounge access for GS members traveling domestically too. It’s also a shame that they don’t offer anything at all to people traveling in domestic “first class” either, unless you have some type of status or membership. If I am flying Austrian Airlines business class out of ORD, given that it departs from T5, could I still access the UA Polaris lounge in T1 day of departure? Yes. A little cumbersome but certainly permitted. Thanks Matthew! Assuming then my boarding pass will allow me to go through T1 despite departing from T5 – and then take the shuttle bus back airside? Great article, also! If I am flying to Tokyo, from Chicago, in ANA’s business class, am I into stay this lounge?